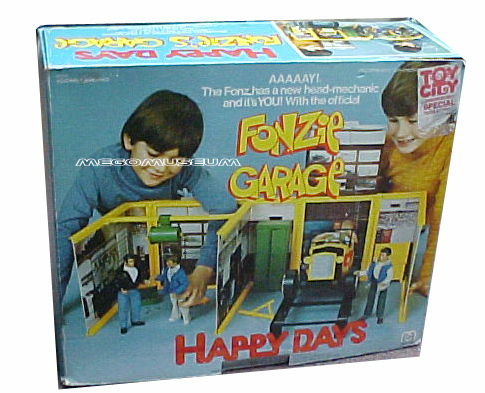 The Mego Happy Days line is one of the better television toy collections. 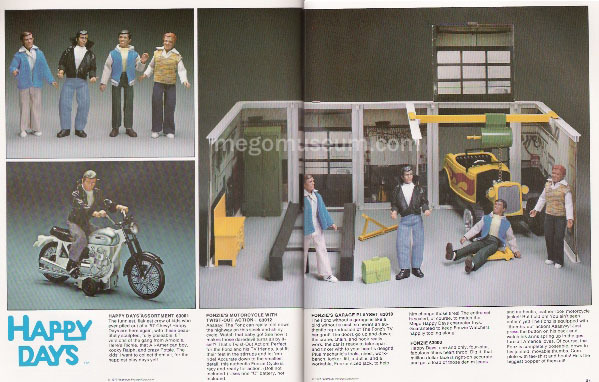 Although there are some likeness problems, particularily with the dour Richie Cunningham, the collection is far better than Mattell’s Welcome Back Kotter Series, for example, if only because of the superior Mego possability and 8 inch scale. 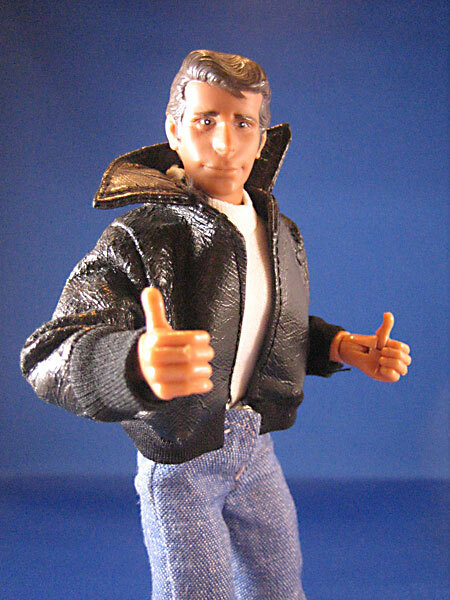 The Fonzie doll, with his jointed thumbs and “thumbs up” action through the mechanism in his back is one of Mego’s better efforts, and was a popular toy in his time. 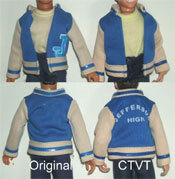 The detailing of the high school letter sweaters on Richie and Potsie is particularily nice. 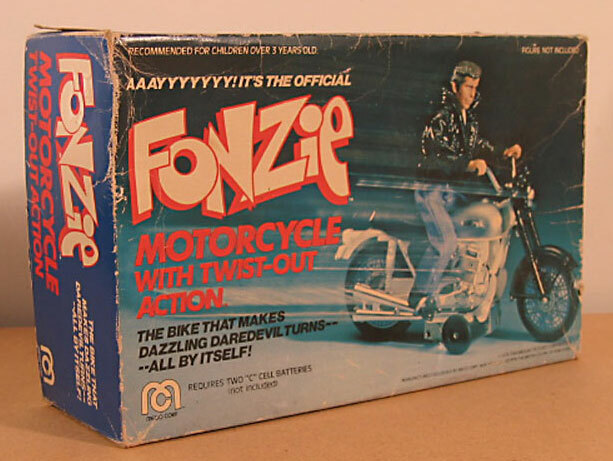 This line was rounded out with a Fonzie’s Garage playset and Fonzie’s Motorcycle. 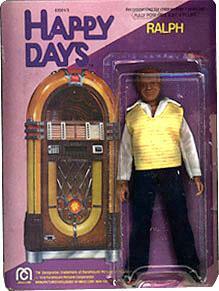 The line debuted in 1977 and continued in 78. Note that Richie and Ralph are wearing white tennis shoes with dark side stripes. 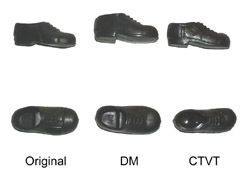 They would ship with standard Mego dress shoes. 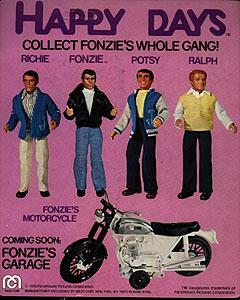 Two more figures and a 12″ Fonzie were planned for 1978 but eventually dropped. 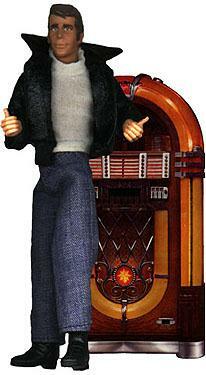 The Fonz wears bluejeans that have been reproduced by Classic TV Toys. The repro’s are taller in the waist, longer in the leg, and lower in the crotch. 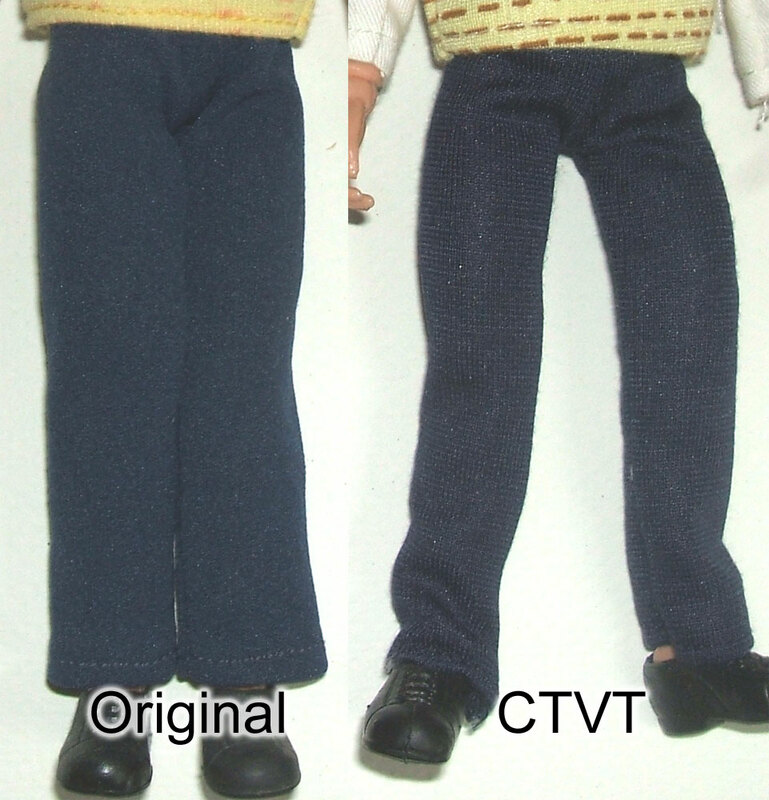 They also have a lighter thread than the dark blue mego used. 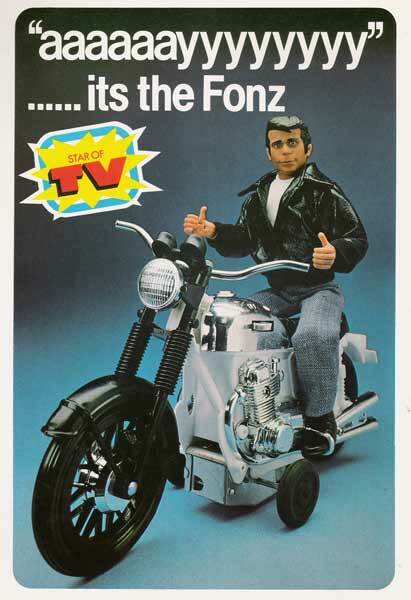 Fonz wears a white shirt under his jacket. The shirt has a collar and opens in the back for the thumbs up action. It closes with a snap at the back of the neck. This shirt has been reproduced by CTVT. The repro is more bright white, doesn’t have the collar, and doesn’t open in the back and no snap. There is a rough slit cut in the back for the thumbs up action level to stick through on the CTVT shirt. 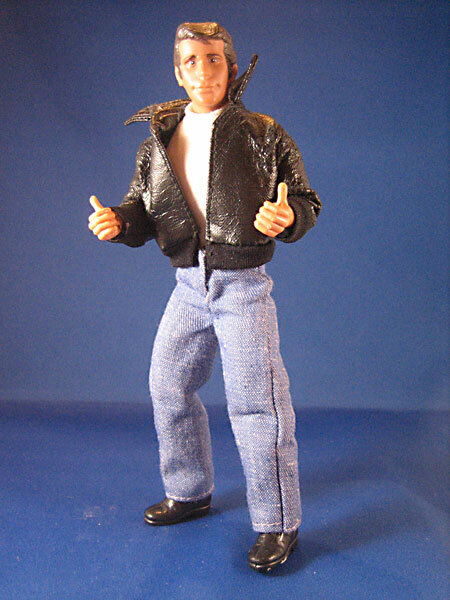 The Fonz has to have his black leather jacket. This jacket has been reproduced by CTVT. The collar on the reproduction is taller, and the jacket is shorter at the waist. The cloth at the waist of the reproduction is not as wide as the original and the opening at the front of the jacket doesn’t taper down from the collar like the original does. 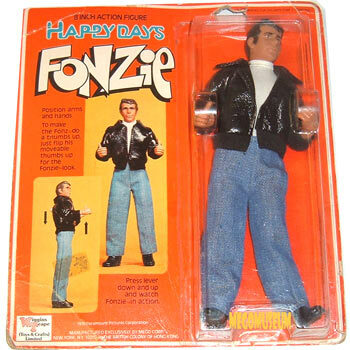 Fonz wears boots that can also be found on the Duke boys, Huggy Bear from Starsky and Hutch and sometimes on Hutch himself. 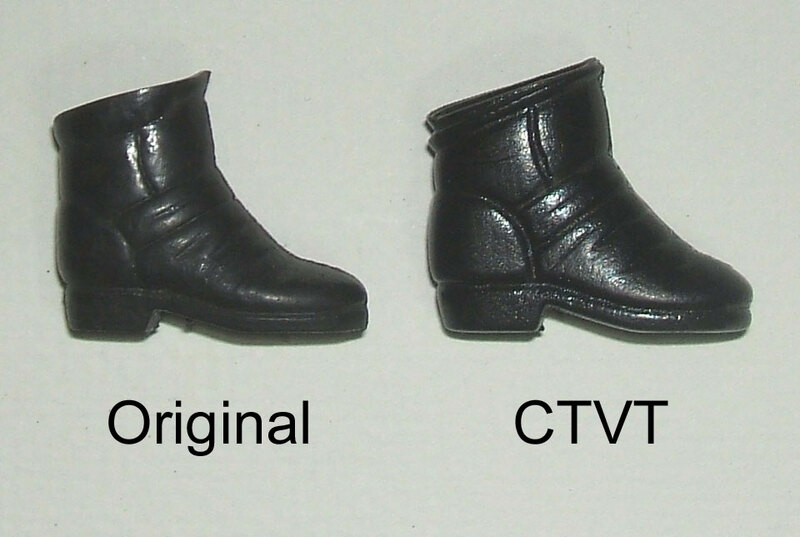 These boots have been reproduced by CTVT. The reproductions, while the same height are thicker with a wider foot opening. They have a rough texture to them as well. They are unmarked. Italian Harbert Cards are known to exist as well. 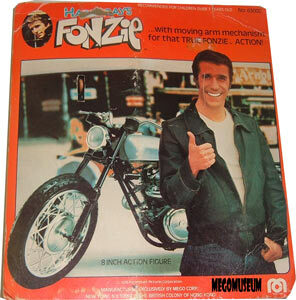 Mego had planned to create a 12″ version of the Fonz and even sculpted the head, the figure was scrapped for reasons unknown. 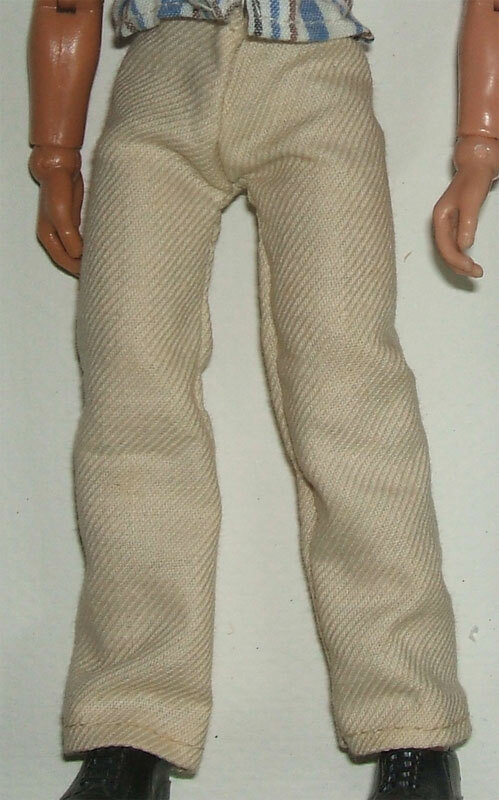 Richie wears an off-white pair of pants that are unique to the character and have not been factory reproduced. 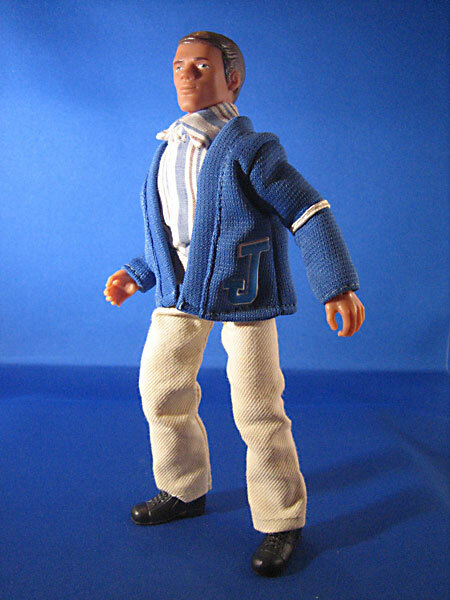 The Classic TV Toys reproduction of Richie sports blue pants. 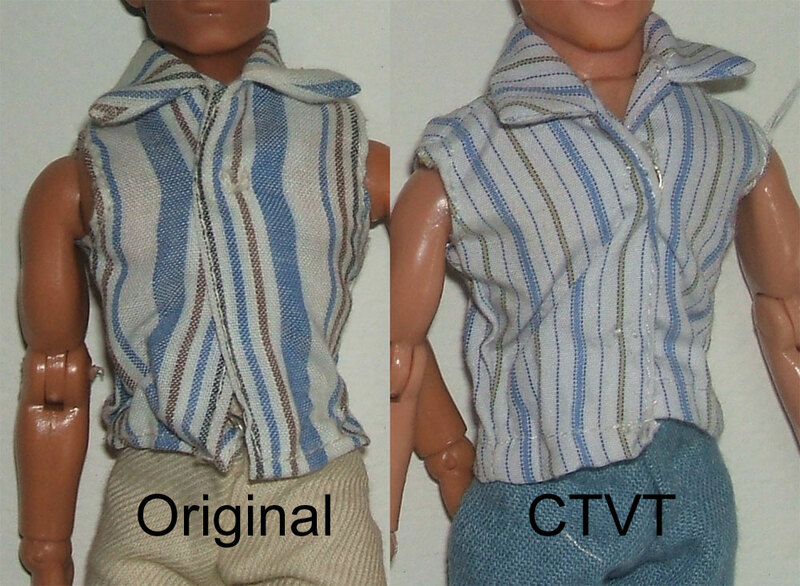 Richie’s shirt has been factory reproduced by CTVT. The reproduction snaps from the opposite side and the pattern of the stripes are different, although the color scheme is the same. 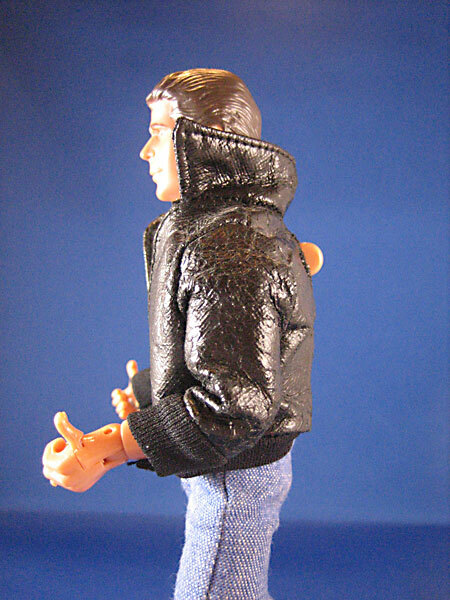 Richie wears a letterman sweater that is different from Potsie’s letterman jacket. 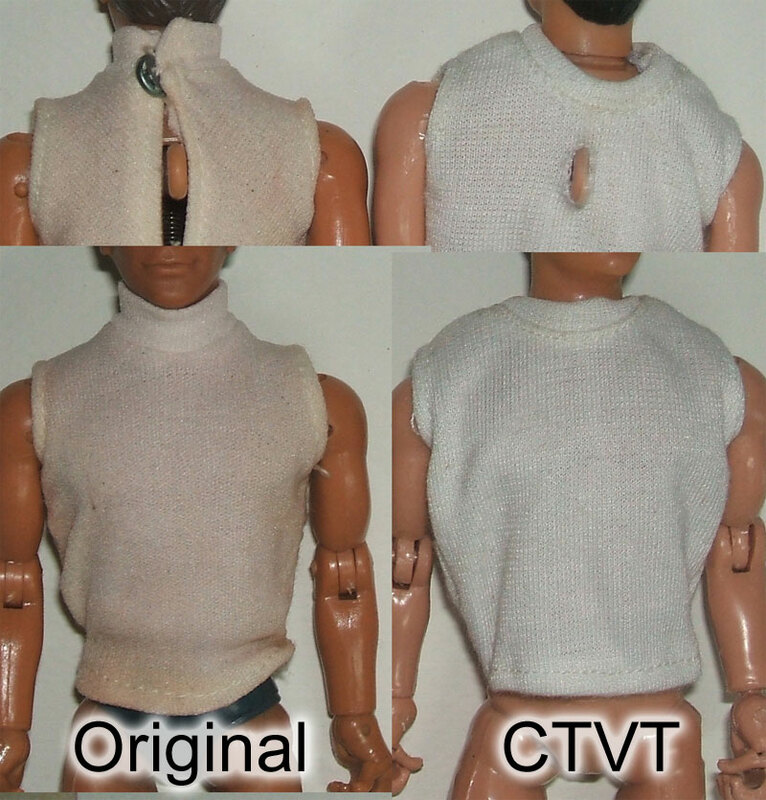 This sweater has been reproduced by CTVT. The reproduction is shorter at the waist and the “J” on the front of the sweater is screened on, while the original has a raised vinyl letter. 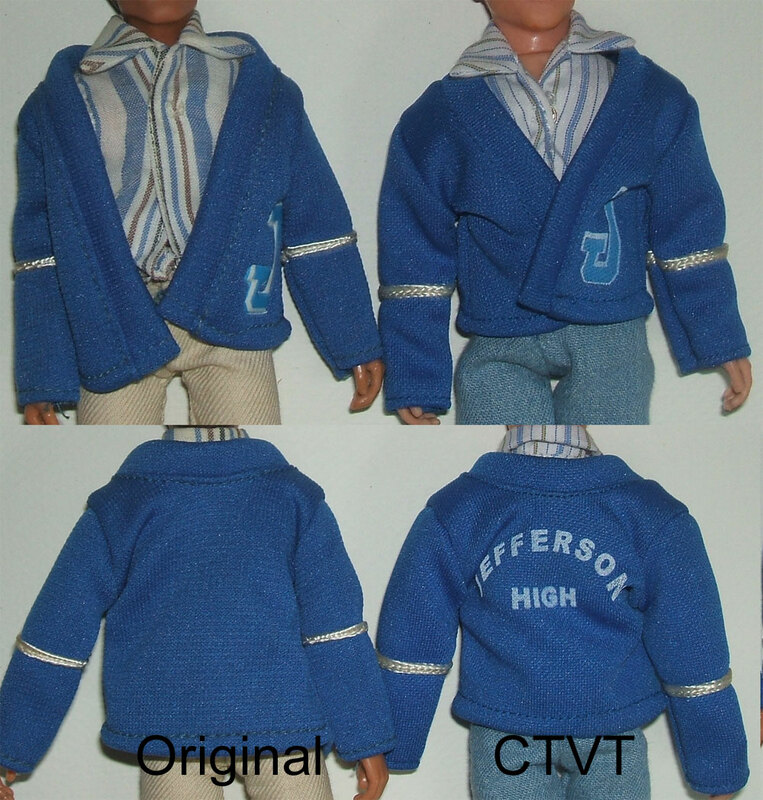 CTVT also added a screened “Jefferson High” on the back of the sweater that didn’t exist on the original version. 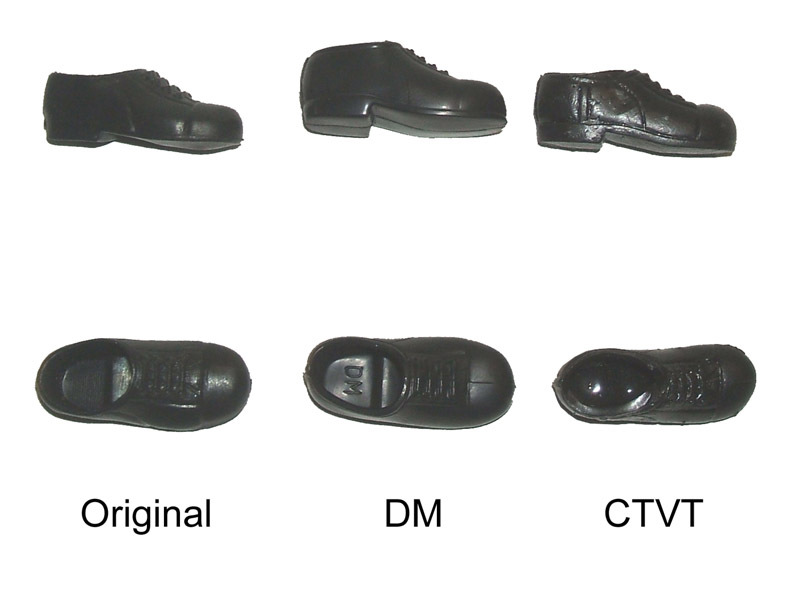 Both Doctor Mego and CTVT have made black shoes. Doc Mego’s are a little bigger in appearance. They are marked DM on the inside. 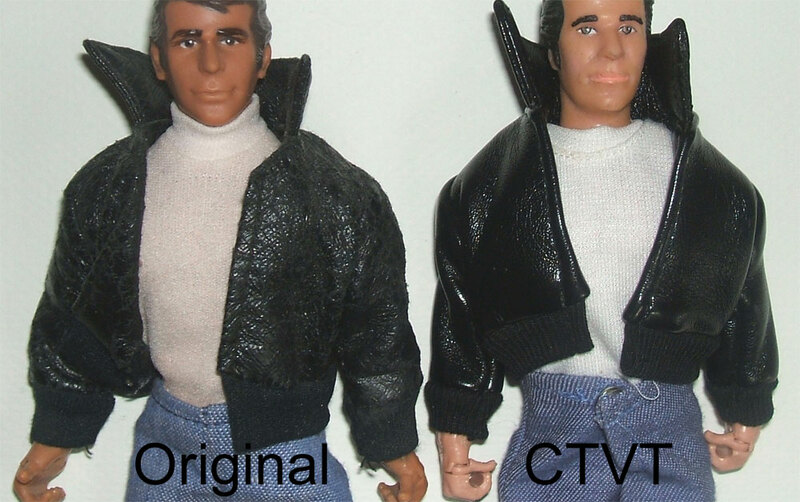 Classic TV Toys version are more narrow and tend to look a little rough with occasional flashing evident. CTVT’s are unmarked. Potsie sports blue pants that are unique to the character. Made of a heavy cloth, but not jean type material, these pants are a solid blue. 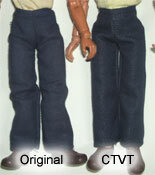 They have been reproduced by CTVT, but the repro’s are a little more jean like. You can see some slight white through the blue here and there creating a more jean type feel on the reproductions. Potsie’s shirt has been factory reproduced by CTVT. The reproduction is more yellow than the original, but otherwise pretty accurate. Another difference is the thread color. 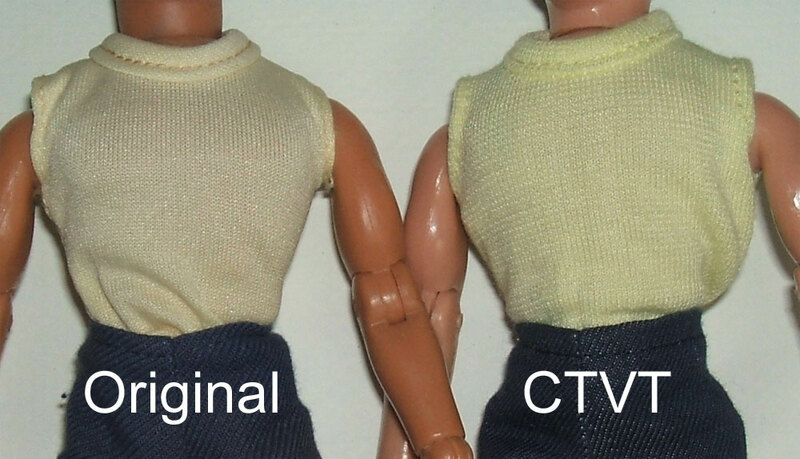 The original is more tan/off-white, while the repro thread is yellow. 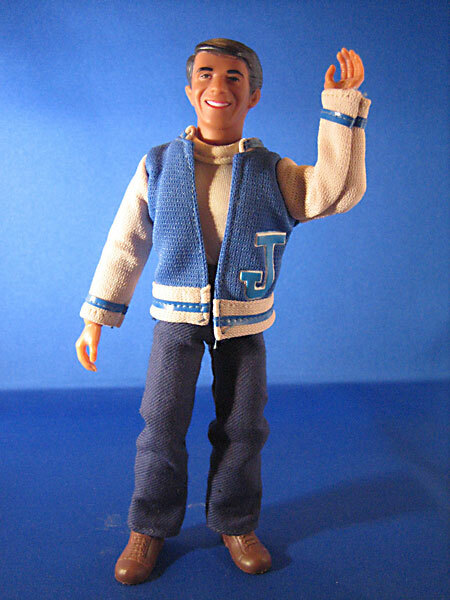 Potsie wears a letterman jacket that is different from Richie’s letterman sweater. This jacket has been reproduced by CTVT. 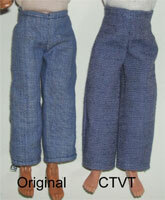 Although similar, the blue strips on the waist and cuffs of the repro are darker blue and thinner. CTVT omitted the “J” on the front of the jacket and added the screened “Jefferson High” on the back that the original does not have. 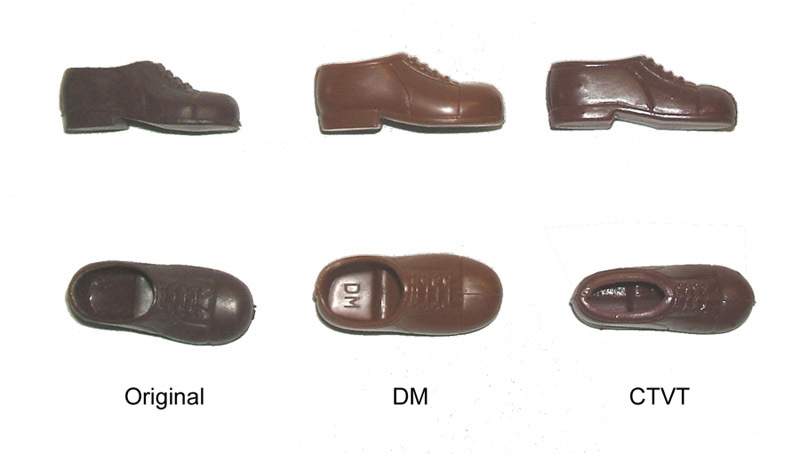 Both DM and CTVT have made brown shoes. Doc Mego’s are a little bigger in appearance, and lighter in color. They are marked DM on the inside. 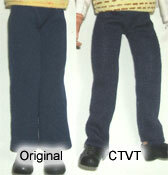 Classic TV Toys version are closer in color, although a touch more red. They are more narrow and tend to look a little rough with occasional flashing evident. CTVT’s are unmarked. Ralph wears a pair of blue pants, but unlike Potsie’s, these are made of a stretchy material. 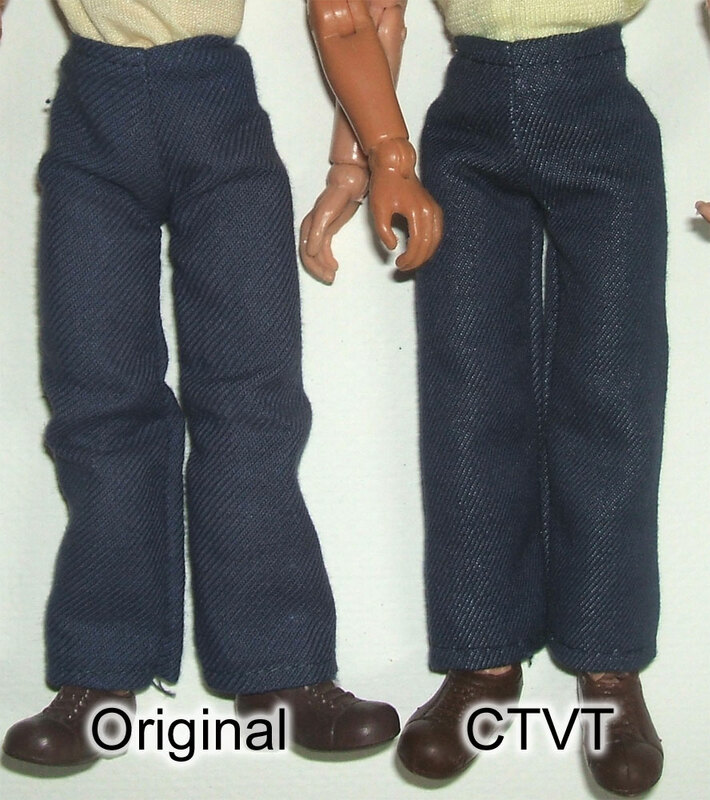 These pants have been reproduced by Classic TV Toys. The repro’s are a touch darker blue and have a bit of a texture of tiny squares in them. They also fit more snug. Ralph wears a white shirt that opens in the front but does not have snaps to secure it. The original is very transparent and the body can be clearly seen through the material. This shirt has been reproduced by CTVT, but the reproduction is a much heavier material and is not transparent at all. 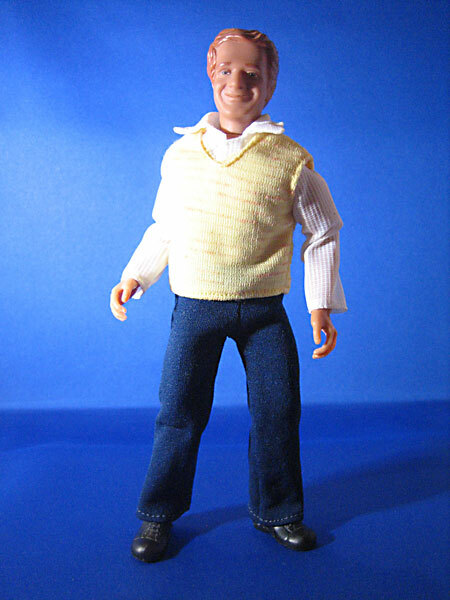 Being the stylin’ dude he is, Ralph wears a hip sweater vest. 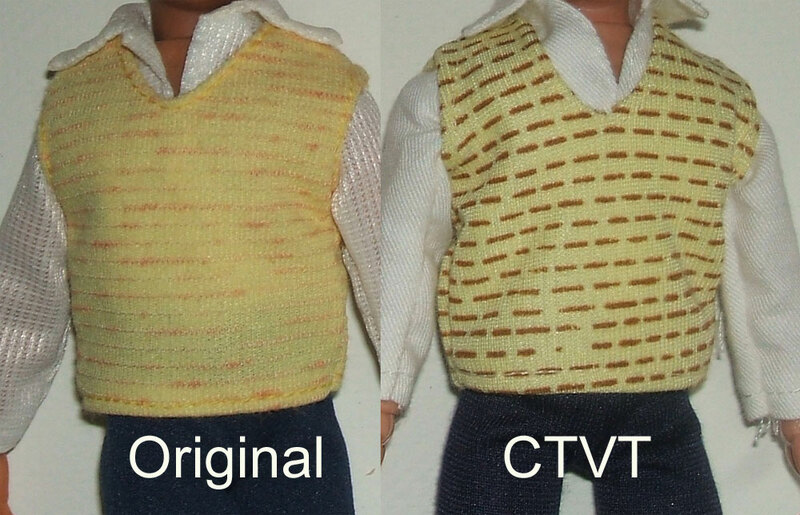 The yellow sweater vest has some orangish color highlights that run horizontally, and randomly throughout the material. 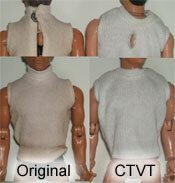 This vest has been reproduced by CTVT. The reproduction has brown highlights instead of orange, and there is more of a pattern to them. A series of dashes in a very organized pattern, unlike the highlights on the original. 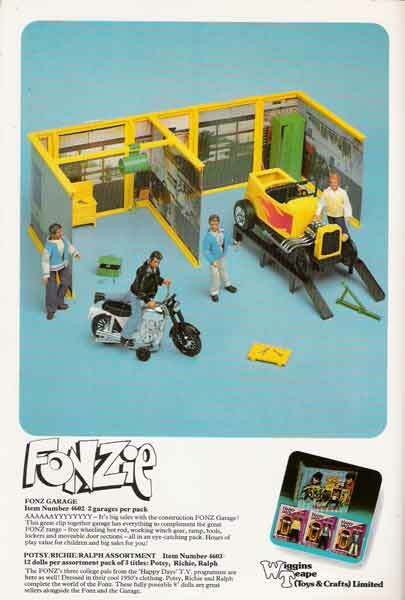 the Garage playset. 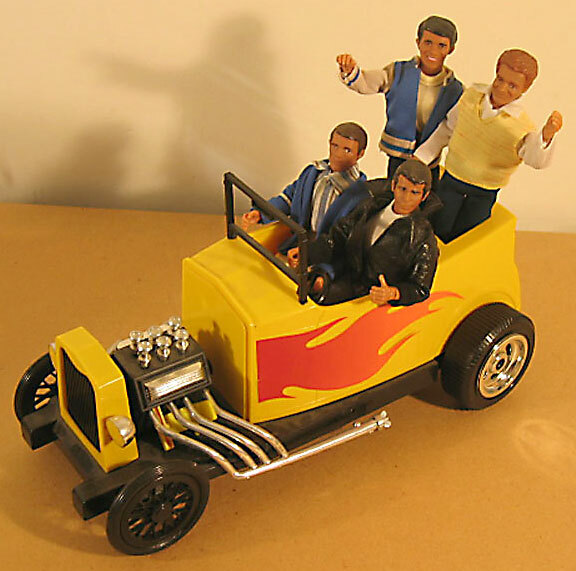 Later Mego pitched it as “Greased Lightning” for the proposed but never produced 8″ line for the hit film Grease. 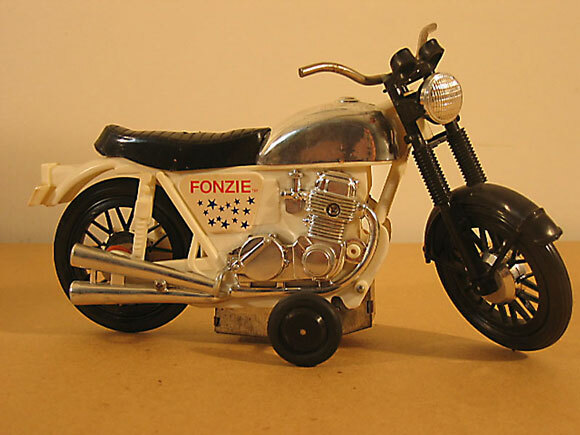 The Fonzie Motor Cycle would later make an appearance as the CHiPs Cycle but the twist out action would be removed by this point.